Fantasia Viper 54″ remote control ceiling fan with LED light in stainless steel, with dark oak finish blades features an integral light. The remote control dims and turns the light on and off and selects the three forward speeds that give an impressive airflow of 6600 cu/ft per minute. Supplied with two dimmable 4.8w LED lamps that give 910 lumens of light. 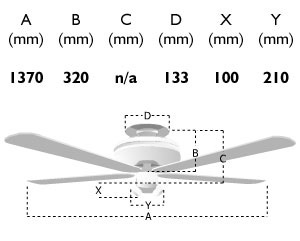 This best selling remote control Viper ceiling fan can be fitted with an optional flush mount kit (333456) for rooms with limited ceiling height. Supplied with a 6″ drop rod but longer drop rods up to 72″ are available if required; please contact us for this option. This Fantasia Viper 54″ remote control ceiling fan with LED light in stainless steel, with dark oak finish blades is virtually silent and supplied with a manufacturers 10-years warranty on the motor.